Adorned with his portrait or signs of the zodiac, the coins issued by Jahangir (1605–27 AD) are a development from the epigraphic, aniconic coins issued by most Muslim rulers. Jahangir struck his zodiacal coins in both gold and silver. Those in gold are known for all 12 signs of the year, while those in silver were only struck for the first five signs. 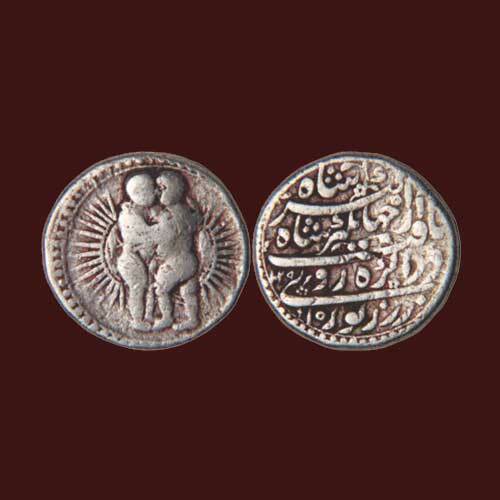 In long line of Zodiac coins, there was this silver Gemini coin of Agra mint. These Zodiac silver coins of Jahangir are highly sorted after by collectors. On its obverse is a ‘Gemini’ sign twins standing face to face and embracing, right-hand twin with left leg raised, all sign designs are set against the backdrop of the sun rays. The reverse has poetic couplet written in Farsi “Yaft Dar Agra Ruye Zar Zewar Az Jahangir Shah Shah Akbar’’, with the AH and regnal year below. Classical Numismatic Gallery sold an extremely rare silver Gemini coin for INR 6,10,000 on 15th March 2013.